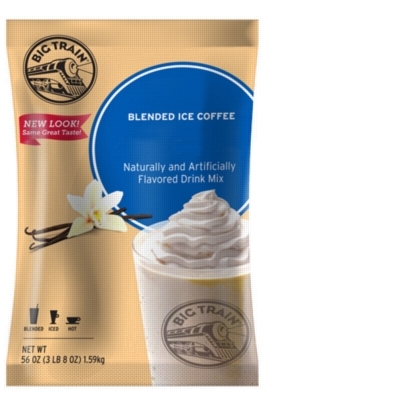 Invigorate your senses and indulge with an aromatic cup of Big Train's Blended Ice Coffee! Made with pure Arabica coffee, with no hydrogenated oils or trans fats. Simple to prepare - just add two scoops to water (or milk) & ice, blend, top with whipped cream, and enjoy a decadent coffee frapp� at home! Can also be prepared as a delicious cafe latte by just adding hot water! One case = 5 3.5lb bulk bags. INGREDIENTS: Sugar, Coconut Oil, Corn Syrup Solids, Cocoa Powder (processed with alkali), Nonfat milk, Coffee, Natural and Artificial flavors, Sodium Caseinate, Silicon Dioxide (anti-caking agent), Salt, Guar Gum, Xanthan Gum, Dipotassium Phosphate, Propylene Glycol Esters of Fatty Acids, Mono- and Diglycerides, Soy Lecthin, Carrageenan Gum, Annatto Extract (for color).